This is a longer than normal post, but I feel it is important that you please take the time to read it in it’s entirety. I have been wanting to address this for quite a while and this appears to be the appropriate time since I have been receiving numerous comments about the speed of the greens. When I first started working here over 6 years ago, I was asked in the interview process if I was willing to post greenspeeds on a daily basis. I said yes, but was always concerned about the consequences. This was a new part of my daily routine and a new part of your daily golf game. I can honestly say that a day didn’t go by when the speed of the greens wasn’t met with great criticism regardless of what “number” was placed on the Starter Hut. No matter what the number was, it was immediately criticized for not being accurate. Some said the greens were faster than the posted number but a vast majority commented that it was extremely inaccurate and that the greens were significantly slower than the posted number. This routine had become the single most stressful part of my job and I was constantly amazed at how rounds of golf would be ruined before they even got started because of a simple number that wasn’t to a players liking. With strong encouragement from the USGA and approval from the Green Committee and Board of Directors, we stopped posting green speeds two years ago. Without question, I feel it has improved everyone’s mentality before teeing off and it has certainly eliminated a lot of unnecessary stresses for myself and my staff. It has been and always will be a top priority for me to keep the greens as consistent as possible while maintaining a healthy playing surface. It is not uncommon for speeds to vary from day to day based on our rolling program and other external factors. During a typical week of the peak season (see below) we will roll on Wednesday, Friday, Saturday and Sunday, so please keep this in mind. University research has shown that rolling more than 3-4 times/week in conjunction with a daily mowing schedule is the threshold before the turf can become overly stressed and show signs of decline . This is especially true for Annual Bluegrass, the predominant turf on our greens, in the heat of the summer (remember last summer?). Contrary to popular belief, I do not have complete control over the speed of the greens on a daily basis. I have compiled a list of factors that will hopefully help you become more educated on some of the things that impact the speed of your greens. 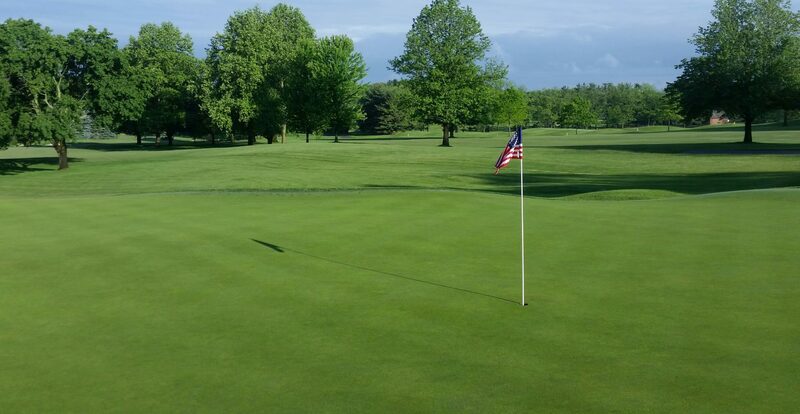 Staff: We are only at peak staffing levels for about 3 months (Memorial Day to Labor Day) which means that there may not be someone available to roll on the day you are playing, especially in the spring and fall. We make every attempt to keep a consistent rolling schedule, but it doesn’t always work as surprises can and do happen at any moment. Weather: What happens to your yard after it rains? It grows and typically grows much faster than it did before it rained. Rainfall provides the turf with clean, usable water that helps to flush elements from the soil that tie-up nutrients, therefore making the nutrients readily available to the turf. Nutrients lead to healthy turf which can lead to additional growth. Growth Regulators: Growth regulators work and work very well, but despite what you may think, they do not completely stop growth, they merely slow it down. Over the years we have found a schedule that will provide very consistent results from day to day, minimizing surges in growth, but like everything else, the performance of the product is predicated upon several of the factors listed above. The game of golf should not revolve around a number that was originally intended to measure consistency from green to green NOT the speed of the greens (this alone is a topic for another post). Having said that, please understand that my staff and I try our hardest to give you some of the fastest (within reason), most consistent and enjoyable greens in the region on a daily basis, but sometimes outside influences lead to results that are temporarily out of our control. Please consider which factors may be at play if the greenspeed is not to you liking on a particular day. Lastly, I would encourage you to spend a few moments before each round on one of the practice greens. They are maintained EXACTLY like the greens on the golf course and will give you a good reference as to what the greens on the course will be like. Thank you for reading and please let me know if you have any questions or comments.